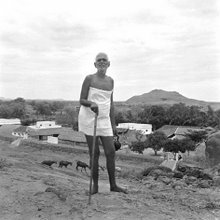 "Whatever a great man does is followed by others"
IN 1908, Seshadri Swami paid a visit to the Maharshi who was then staying at the Mango tree cave. He spent some time closely observing the Maharshi with a view to reading his mind. As he could not do so he threw up his hands in exasperation and said that he could not understand what the Maharshi was thinking about. The Maharshi didn't respond. Seshadri continued, "It is enough if one worships Arunachaleswara. He will grant liberation." Maharshi: Who is it that worships and who is worshipped? Seshadri broke into a loud laughter and said: "That is not clear; that is the whole problem". Thereupon Bhagavan gave a long discourse on the experience of advaita [?] which Seshadri listened to very attentively. At the end he said, "I am not able to say anything, all of this is unintelligible to me. It is all a blank. As for myself, I am content to be a worshipper always." Later he prostrated to the peak of the hill fifteen times and left the place. Seshadri seemed to prefer worshipping the peak of the hill as being symbolic of Arunachaleswara, the Almighty. Most people had a similar opinion. For them, the hill was the form of Arunachaleswara, the column of light. The recollection of the very name "Arunachala" or a darshan of the hill would erase all attachments. A column of light is raised at the Arunachaleswara temple on every Krittikai day to reiterate that the hill represents the Jyotirlinga. This column is raised at the very moment that a light is lit on the peak of the hill. The latter is fed by camphor, ghee and other materials, and rises up to the skies and remains like that for some days. It is also visible at several distant places. The spreading rays of the light justify the name, Arunachala. That column of light is also symbolic of the light within the cave of the Heart. The sthala-purana describes Arunachala as the centre of the world and also as the Kasi of the South. A pradakshina (circumambulation) of the hill is deemed to be the equivalent of visiting all the pilgrim centres of the land. It also symbolizes a pradakshina of Parameswara himself. According to legend, Vinayaka beat Kumaraswamy by the simple device of circumambulation of Easwara, such is the power of giripradakshina. Its importance for the devotees cannot be overemphasized. The Maharshi also performed it not for his own benefit but in order to set an example to his devotees and disciples. There is a well-laid road round the hill along which shrines, tanks, mantaps and samadhis abound. The road is also lined by huge trees providing shade to the passersby. There are also resting places along the road. Everyone carries out the pradakshina in his or her own way. Some simply walk, some others roll along the road, yet others halt after every step and undertake an atma-pradakshina at each halt or prostrate to the hill. Generally the pradakshina is completed in three hours. the Maharshi used to do the pradakshina regularly at least once a week or even more frequently. Usually, if he set out in the morning he would return to the ashram by nightfall. Similarly, if he started in the evening he would return by day-break. Occasionally, the pradakshina might take two or three days. The Maharshi would walk very slowly as laid down in the scriptures and would be in a state of samadhi most of the timethe body would move mechanically. The Maharshi would also rest a little after every mile. At mantaps devotees would stop him and offer food or other refreshments. The devotees would compete with one another in extending their hospitality to Bhagavan, who would oblige all of them. The behaviour of those who followed Bhagavan varied from person to person. Some were silent, some played musical instruments or sang ecstatically, like bhajan groups. Usually knowledgable in music, the devotees had the added impetus provided by bhakti [?] and sang excellently bringing pleasure to the listeners. chanted Bhagavan's 108 names or sang hymns composed by the Maharshi or others. The devotees would feel that the Lord himself was in their midst and so they expressed themselves, without any inhibition. During the pradakshina period the devotees were submerged in an ocean of devotion and were swept away by the cool breeze of Jnana. The Maharshi's silence was very deep and one wondered if he could speak at all. But when he spoke, his words were clean crystals of wisdom. Bhagavan composed several hymns during his several pradakshinas and at those times he was in the akasa of the interior where lay no mind, no word, no seer, no seen, no worshipper, no worshipped; there was only one-the Atma.